Welcome to a new feature on Ask Grandma J! By new feature, she's talking about a recent attempt at domestic violence training here at the weed infested ghost town known as the Spa. 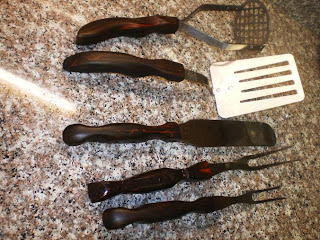 Grandma J was looking at her old Cutco cooking utensils, and realized she's schlepped these sturdy reliable tools across rivers, valleys and state lines. 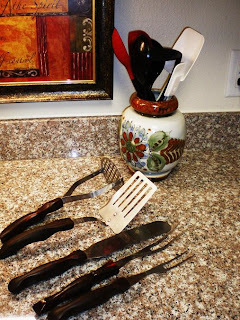 She bought these tools as a young bride from a door to door salesman, who was her husband as she sat drinking Folger's instant coffee with her neighbor Wilma. The year was 1965. Grandma J has had several hundred sets of spatulas, ricers and masher stuff over the years, hey where's the masher? like the plastic stuff in that container. Nothing has lasted and served her as well as the Cutco utensils. 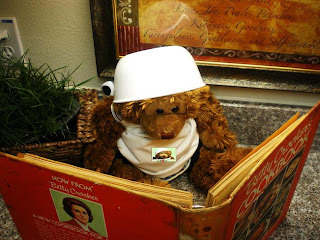 Lately, Phillip Johnny Bob has been hanging around and showing some interest when Grandma J nukes popcorn cooks, so she thought she'd broaden his horizons in the kitchen. 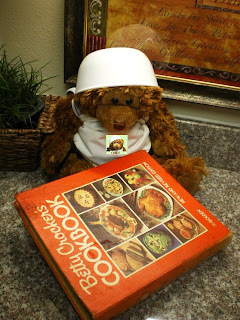 Grandma J handed PJB her old cookbook, that served as her bible for many years. But found it disgusting hard to figure out with all the references to measurments and foreign phrases like filet and ala carte. So, Grandma J thought she'd try the hooked on phonics for cooking method of teaching PJB. Or, simply put....hands on! 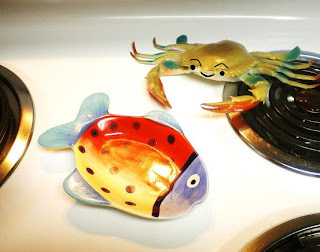 Oh, for crab's sake! Crusty has his eye on Grandma J's spoon rest! Could it be possible that Crusty thinks it's an aquamarine friend from the Chesapeake Bay? Phillip Johnny Bob decides to take matters into his own hands and put Crusty in his place. Thank goodness Grandma J was there to save Crusty....and try to salvage the family unit and go back to square one with the cooking lessons....by eliminating the seafood section of the old cookbook. You forgot to take your meds again, didn't you? Is that a chip clip on the back of Phil's apron? I have that same cook book too! The strawberry pie recipe page tastes real good! 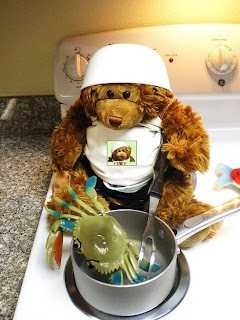 Watch out Bobby Flay--there's a new bear in town. ha! Maybe PJB was in the mood for a little He Crab Soup? I love you, Grandma J!!! Love the bowl on top of PJB. I have cookbooks too, but I don't know why! They are in the cupboard taking up space. I have one just like yours...and I got married in 1965. He wasn't a traveling salesman, just a wonderful, funny man. He still is! Such a fun day!! And yes, I am on the mend!! This is too funny. I hope Crusty was not too alarmed and will soon forget this incident!!! I love utensils that last forever. I mean last a lifetime!!! Oh my gosh! You are so clever and funny! I LOVE this post. It reminded me of when I sold cutco knives.... that wasn't the best career choice for me : ) but it is a good memory! I love your old cookbook! 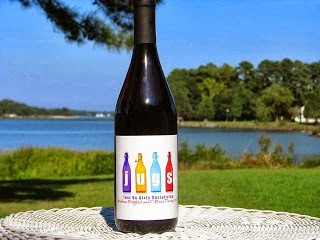 Your family unit has so much fun together. I really want to move in. Immediately! OK. Grandma J., this is one of your best, and you have many. This is in the BOSSY category of funny (for me anyway) because at the TITLE alone I was already laughing. Plus, I know the work that goes into simply photographing Peanut Butter and Jelly--I mean PBJ. Although he's an amiable fellow, he can sometimes be difficult on the set, as was evidenced by his inability to get along with his castmate, Crusty. If I were rating this movie, I'd give it two crab claws up. this is awesome grandma j!! 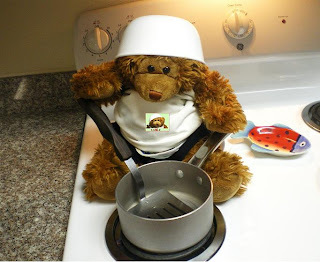 without being too presumptious hough can i lend j bear a few tips... first stay away from the open flame, it looks like he is a little to close to the burner for my liking.. and second ditch the hat. 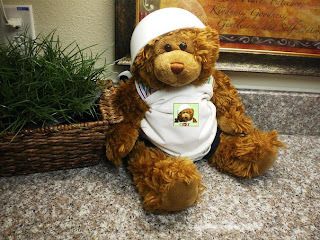 it looks like a construction workers helmet instead of a chef's hat... but then again he may need the hard hat, him being a new cook and all things may get a little messy!!... great post!!!! GJ this was wonderful! Just love it! I thought of Crusty right off when I saw that spoon rest! Too funny. I tell you....you need to be writing for Saturday Night Live! Love you and miss you too! New topic: Any chance you're going to review the movie, "The Invention of Lying" for us?? I love the mental pic of the photo op starting...but is PJB okay on the stove? Watch the burners! lol.